"Excellent communication and fast shipping. Perfect service. "I liked your website for the supply of Ubiquity, as well as for very competitive prices. Beyond this, I was very happy with the speed of order processing and delivery of the same." "I found you the Ubiquiti distributor page, soon before my first order. The Ubiquiti product availbility is bad, but I think it is not your fault. 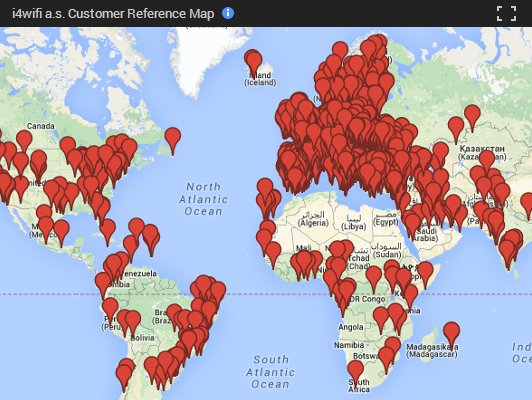 Regarding MikroTik products, I am pleased with the availability. I read the FAQ (I did not know about it unil now), and it is clearly written in corrent language. I find it helpful." "Perfect collaboration in pre and post sale. Very professional support to best choose the right components. I asked for a very fast support to buy components to start a wireless network for university conference just 6 days before, I4-WIFI assisted me from the start choose right components to the end giving me best information about shipments, payment etcetera. All was perfect!" "fast reaction on e-mail questions and orders." "We really enjoy cooperation with you, just positive experiences in the past. fast delivery, good availability etc." "Your site is well done: clear, complete and unambiguous! The prices are good and you sell to private citizen. I personally was in Prague at your shop . I found courtesy and professionality; the shop organization give the same feelings. It is my opinion that i4wifi i a very professional company." - the shipping cost are very good"
"for few time we have contact, i feel the cooperation is good." "I'm very satisfied with the cooperation till now. Traders are very communicative people. Quick order processing. Quick shipment. Very adaptive and helpfull." "Traders have been very helpful. Great support." "Cooperation is perspective and interest." "Open communication. On time payments." "I find cooperation with you to be very good, quick reply, affordable prices." "Good. i4wifi has good availability of Ubiquiti Networks products and competitive prices. Traders are proactive and professional."